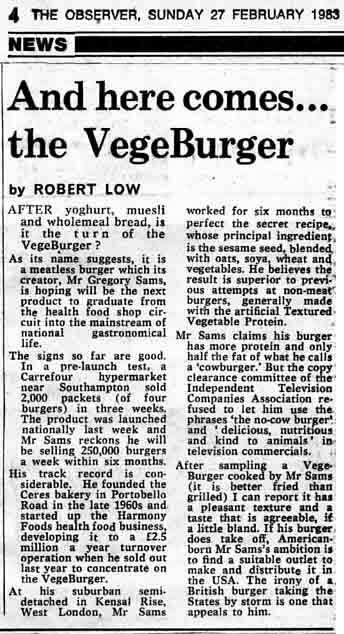 “After yoghurt, muesli, and wholemeal bread, is it the turn of the VegeBurger?” That’s the first line of an Observer article heralding the coming of the first commercial veggie burger—the VegeBurger—released in 1982. Problem was, it wasn’t a burger. It was a pouched mix of wheat gluten, sesame, soy and oats that needed to be rehydrated and formed into patties before cooking. From those humble (and we’re imagining tasteless) beginnings 35 years ago, vegan foods have transitioned from niche to mainstream through better and better products, with U.S. sales hitting $3.3 billion in 2018. But the industry may just be getting started. In recent years, companies have moved beyond the typical soy-based patties utilizing new food technology to create burgers and other meat-based staples that look and feel like the real thing, blurring the line between plant and animal while also helping save the planet. And these foods are catching the eyes of their target audience: curious carnivores. Clover, a vegetarian restaurant chain in the Greater Boston area, sold a meatball sandwich using Impossible Foods’ cultured meat on their menus as a trial. After a great reception among vegetarians, vegans and carnivores alike, it earned a permanent spot on their seasonal menus. So if new technology and consumer demand is powering breakthroughs, where is the industry headed? Some of the biggest strides in vegan food are coming from high-tech, insanely complicated processes. For example, Impossible Food’s burger meat ‘bleeds’ because it’s made with heme, an iron-containing molecule that gives beef its red color and metallic taste. (It’s also one of the main things that makes beef taste like beef.) Heme is found in virtually all living things, and researchers started by extracting the molecule from soy plants. But the low amount of heme found in soy made extraction unsustainable, so Impossible researchers found a way to create heme via fermentation by inserting leghemoglobin into yeast and expanding it exponentially. The key to creating these realistic plant-based meats is to reverse engineer animal flesh and determine how to manipulate plant protein into a similar taste and texture. “When you study and break down meat, the core components are protein, fat, flavor,” says Todd Boyman, CEO and co-founder Hungry Planet, a vegan food company based in Saint Louis, Missouri. “To convert it [proteins, fats and flavors] into these various types of meat analogs, we apply heating, cooling, and pressure [to] these plant proteins,” says Boyman. Hungry Planet makes a wide variety of plant-based meats, including beef, chicken, pork, turkey, lamb and crab. It was important to the Hungry Planet team to not only create pseudo meats that taste good but were also healthier and could be served as one-to-one substitutions in recipes. Creating these complicated foods is no easy task—Franklin said it took “years” to develop Vegan Egg, a common theme industrywide. There’s a clear market and demand for this kind of innovations—the sale of plant-based meats grew 24 percent in 2018, according to the Plant Based Foods Association. Boyman says they’re currently shipping Hungry Planet products all over the world. But this new kind of meat ain’t cheap. For example, the Impossible Meatball Sandwich is the most expensive sandwich on the Clover menu by about $3 to $5. Beyond Meat, a company often compared to Impossible Burger, typically sells for $5.99 per 8 oz package, double the price of lean beef. But Boyman believes that as demand goes up and the plant-based meat production is streamlined, these prices will go down, a trend that’s started to play out in the last few years. In 2013, when cultured meat was in its nascent stages, the Dutch-based company Mosa Meat said it cost around $1.2 million to develop one pound of the world’s first lab-grown burger. Additionally, these high-tech burgers and meats can be difficult for consumers to find. Impossible Burgers are currently only found in select restaurants, while Beyond Meat rolled out its patties to major retail chains like Target in 2018. Boyman says Hungry Planet’s products are currently in a limited pilot retail and he’s hoping for a wider release in 2019. To meatless burgers, and beyond! Although vegan favorites like MorningStar Farms and Gardein have long been used to help transition to a more plant-based diet and enjoy a similar ‘meaty’ taste they miss the mark for most carnivores. Most of these processed products are made from soy protein isolate or textured vegetable protein, which may make for a tasty vegan product, but are hardly comparable to their meat counterparts. That’s why part of the mission of these tech companies is to show meat eaters that vegan food can be delicious and familiar. It is becoming increasingly important to wean ourselves off meat. Animal agriculture causes at least 14.5 percent of all man-made greenhouse gasses, consumes about one-third of Earth’s fresh water, and is the leading cause of deforestation in the Amazon. It’s unsustainable. These lab-grown products use a fraction of those resources. Impossible Foods says their burger uses 75 percent less water, 95 percent less land, and generates about 87 percent fewer greenhouse gas emissions than a conventional burger. Beyond Meat makes similar claims. There are exciting things on the horizon, too; these cultured foods are gaining in popularity, with some startup companies attracting the attention of billionaires like Bill Gates and billion-dollar companies like Tyson Foods and Cargill Inc. Impossible Foods recently unveiled Impossible Burger 2.0, showing off a plant burger that’s firm enough to be flame grilled without falling apart and reportedly tastes pretty darn good. So if the future of the planet does indeed remain in the hands of gloved food scientists, at least dinner will be delicious. From carrot top pesto to cilantro stem dressing, here’s four tasty ways to waste less food. Courtney is a writer passionate about food, sustainability, and the environment who hopes to bring change and education through her words. Her work has appeared in publications like USA Today, Country Living, and Woman's Day.